Allen, Felicity. Jefferson Davis: Unconquerable Heart. Columbia: University of Missouri Press, 1999. Allen, William C. Senators Poindexter, Davis, and Stennis: Three Mississippians in the History of the United States Capitol." Journal of Mississippi History 65 (2003): 191-214. Bancroft, A.C. The Life and Death of Jefferson Davis, Ex-President of the Southern Confederacy. New York: J.S. Ogilvie, 1889. Beringer, Richard E. Jefferson Daviss Pursuit of Ambition: The Attractive Features of Alternative Decisions. Civil War History 38 (March 1992): 5-38. Canfield, Cass. The Iron Will of Jefferson Davis. New York: Harcourt Brace Jovanovich, 1978. Crist, Lynda Lasswell. A Duty Man: Jefferson Davis as Senator. Journal of Mississippi History 51 (November 1989): 281-95. Cutting, Elisabeth Brown. Jefferson Davis, Political Soldier. New York: Dodd, Mead Co., 1930. Daniel, John Warwick, ed. Life and Reminiscences of Jefferson Davis. Baltimore: R.H. Woodward Co., 1890. Davis, Jefferson. The Rise and Fall of the Confederate Government. 2 vols. 1881. Reprint, with new foreword by James M. McPherson. New York: Da Capo Press, 1990. Davis, Varina. Jefferson Davis: Ex-President of the Confederate States of America, a Memoir by His Wife. 2 vols. 1890. Reprint. Freeport, NY: Books for Libraries Press, 1971. Davis, William C. Jefferson Davis: The Man and His Hour. New York: Harper Collins Publishers, 1991. Dodd, William Edward. Jefferson Davis. In Statesmen of the Old South: or, From Radicalism to Conservative Revolt, pp. 171-235. New York: Macmillan Co., 1911. ___. Jefferson Davis. 1907. Reprint. New York: Russell Russell, 1966. Dugard, Martin. The Training Ground: Grant, Lee, Sherman, and Davis in the Mexican War, 1846-1848. Lincoln: University of Nebraska Press, 2009. Eaton, Clement. Jefferson Davis. New York: Free Press, 1977. Eckenrode, Hamilton J. Jefferson Davis, President of the South. 1923. Reprint. Freeport, NY: Books for Libraries Press, 1971. Escott, Paul D. Jefferson Davis and Slavery in the Territories. Journal of Mississippi History 39 (May 1977): 97-116. Ezell, John. Jefferson Davis Seeks Political Vindication, 1851-1857. Journal of Mississippi History 26 (November 1964): 307-21. Foote, Shelby. Jefferson Davis: Prologue and Epilogue. In Mississippi Heroes, edited by Dean Faulkner Wells and Hunter Cole, pp. 67-104. Jackson: University Press of Mississippi, 1980. Gordon, Armistead Churchill. Jefferson Davis. New York: Charles Scribners Sons, 1918. Hansen, Vagn K. Jefferson Davis and the Repudiation of Mississippi Bonds: The Development of a Political Myth. Journal of Mississippi History 33 (May 1971): 105-32. Jones, John J. A Historiographical Study of Jefferson Davis. Ph.D. dissertation, University of Missouri, 1970. McElroy, Robert McNutt. Jefferson Davis: The Unreal and Real. 2 vols. New York: Harper Brothers, 1937. Monroe, Haskell M., James T. McIntosh, Lynda Lasswell Crist, and Mary Seaton Dix, eds. The Papers of Jefferson Davis. 11 vols. to date (of 15 planned volumes). Baton Rouge: Louisiana State University Press, 1971-. Vol. 1 was reprinted, with extensive revisions, in 1991; Vol. 2 reprinted in 1987. Ramage, James A. Jefferson Davis: Family Influences in the Making of a Great Statesman. Journal of Mississippi History 51 (November 1989): 341-56. Rowland, Dunbar, ed. Jefferson Davis, Constitutionalist: His Letters, Papers, and Speeches. 10 vols. 1923. Reprint. New York: AMS Press, 1973. Sanders, Charles W., Jr. Jefferson Davis and the Hampton Roads Peace Conference: To Secure Peace to the Two Countries." The Journal of Southern History 63 (November 1997): 803-26. Sanders, Phyllis Moore. Jefferson Davis: Reactionary Rebel, 1808-1861. Ph.D. dissertation, University of California, Los Angeles, 1976. Schaff, Morris. 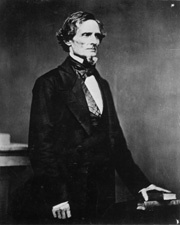 Jefferson Davis, His Life and Personality. Boston: J.W. Luce Co., 1922. Shelton, William Allen. The Young Jefferson Davis, 1808-1846. Ph.D. dissertation, University of Kentucky, 1977. Strode, Hudson. Jefferson Davis. 3 vols. New York: Harcourt, Brace Co., 1955-1964. ___, ed. Jefferson Davis, Private Letters, 1823-1889. New York: Harcourt, Brace World, 1966. Tate, Allen. Jefferson Davis: His Rise and Fall, a Biographical Narrative. New York: Minton, Balch Co., 1929. Winston, Robert Watson. High Stakes and Hair Trigger: The Life of Jefferson Davis. New York: Henry Holt Co., 1930.